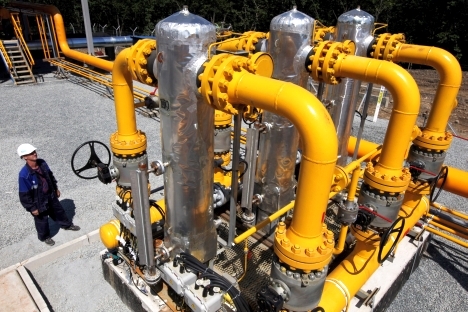 The gas price for Ukraine would now be $485 per thousand cubic meters. Russian Prime Minister Dmitry Medvedev has announced the cancellation of the zero customs export duty on gas for Ukraine. The budget deficit of Ukraine's national oil and gas company Naftogaz Ukrainy will increase by UAH8.2 billion, or around $750 million at the current exchange rate, to UAH56.254 billion due to Russia resuming its duty on gas for the country, Ukraine's Finance Ministry said on its website. During a meeting with Gazprom CEO Alexei Miller, the prime minister noted that in the context of the Kharkyv agreement with Ukraine of April 30, 2010	the Russian government adopted a document establishing the zero duty. "Considering the decreasing international legal grounds for the existence of the agreement and the denunciation of the agreement itself, I am making the decision to [annul] government resolution #291 of April 30, 2010," Medvedev said. "This decision will have immediate direct consequences for Gazprom in future relations with [its] Ukrainian partners," he said. The head of government said that at the last meeting of Russia's Security Council the fate of the so-called 'Kharkyv agreements' was addressed and that afterwards President Vladimir Putin ordered the consideration of the question of denouncing the international agreements signed in 2010. "The State Duma has addressed this question. And considering the change in circumstances that were the direct reason for the conclusion of these agreements, the State Duma denounced the corresponding international documents. The related bill was signed [into law]," the prime minister said. How much of a threat does U.S. natural gas pose to Russia? In the fulfillment of this international agreement, the government adopted a document concerning customs export duty rates from the delivery of gas from Russian territory, Medvedev said. "In the framework of this document a 0 percent customs duty was established," he said. Miller said during the meeting that the gas price for Ukraine would now be $485 per thousand cubic meters. "The signing of the resolution canceling the applied customs duty preference in gas deliveries to Ukraine means for us that automatically, and in strict compliance with the 2009 contract for delivering gas to Ukraine, the gas price will increase and starting in April will be $485 per thousand cubic meters," the Gazprom chief said.